Never compromise on the quality of your tyres, as they are the only points of contact between your car and the road. Infinity INF-030 tyres are built to provide great grip and traction in an environment and in any conditions to make sure you are always prepared for what may come. This gives you better steering and more stable cornering while reducing the risk of skidding and aquaplaning. Not only this, these tyres are built to last and this means you’ll spend less on the number of replacements. INF-030 tyres are a clear winner of high quality value tyres. Infinity INF-030 tyres are built to provide great grip and traction in an environment and in any conditions to make sure you are always prepared for what may come.This gives you better steering and more stable cornering while reducing the risk of skidding and aquaplaning. Not only this, these tyres are built to last and this means you’ll spend less on the number of replacements. 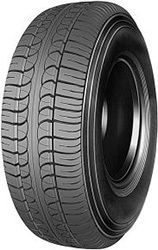 INF-030 tyres are a clear winner of high quality value tyres.